Jane Houston Jones receives the Blair medal from the WAA President Jack Borde with three former medalists in the background. Dr. Gilbert Bruce Blair was born September 13, 1879 in Blairsburg, Iowa and studied at both Tabor and Washburn Colleges in Kansas. He continued his graduate work at University of California, Chicago and Kansas majoring in Physics. He held a fellowship at Lick Observatory too. Dr. Blair taught astronomy at Washburn from 1907 to 1919, and then moved westward, where he taught at the University of Nevada in Reno until his death in 1949. In 1936, Dr. Blair organized the Astronomical Society of the University of Nevada. He is the founder of the Western Amateur Astronomers. Dr. Blair envisioned a grand meeting, to be held once a year, which would bring western amateur astronomers together to exchange ideas and to meet each other. The first Western Amateur Astronomers conference was held at USC in August 1949. 200 delegates from 23 organization attended. It rained! A month later Dr. Blair died of a heart ailment. Dr. Blair's obituary ran in the October 1949 Sky & Telescope magazine. The sixth WAA Convention was held in August 1954 at the Josephine Randall Junior Museum in San Francisco and was hosted by the San Francisco Amateur Astronomers, who hold their meetings at the Randall Museum today. 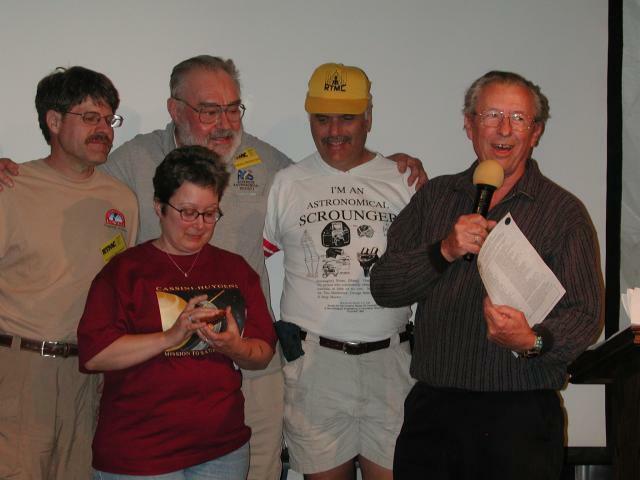 The WAA presented the first G. Bruce Blair Medal to Albert G. Ingalls, editor of the Amateur Telescope Making books. The G. Bruce Blair medal was designed by Eastbay Astronomical Society member Frank Kettewell, who was a cartoonist for the Oakland Tribune. The seventh convention was held in 1955 at Yosemite National Park. A.L.P.O founder Walter E. Haas received the second WAA G. Bruce Blair Medal. Fast forward to the 2004 Riverside Telescope Makers Conference and Astronomy Expo. Imagine my thrill as I walked to the stage and received the 2004 WAA G. Bruce Blair medal! I was surrounded by many past winners as I received this years award. When I went through the award winners list from the past 50 years , I discovered that I knew over half of the awardees personally and admired or was inspired by all of them. Dr Haas inspired me to not just look at the planets but to study and sketch their features when observing through my telescope. Current WAA president Jack Borde, received the G. Bruce Blair medal in 1987, the year I discovered amateur astronomy. 1987 was the year I became an amateur astronomer, first by learning about different types of telescopes then by joining an astronomy club. The following year, I took a deep breath and signed up for John Dobson's telescope making class in San Francisco. A few months later, I was spending all my free time looking through f/7.3 10-inch Stardust, which I still use today. Like countless thousands who preceeded me, I got my start as an amateur astronomer at the hands of John Dobson, so I dedicate this award to John for the years of wonder that he has brought into my life. Every day he inspires me to ask a question, answer a question, or take my telescope out on a local sidewalk and share the wonder of the universe with others. Thanks, John!